Today Miss A and I are off to the Love Food Festival at Dyrham Park. I've been wanting to go to one of these events for ages, but haven't been able to convince the hubby to come with me. They're normally held in Bristol or Bath at an open market place and this worries me with my wayward toddler on the loose with only one parent supervising (ie I won't be able to look at anything because I'll be making sure she doesn't accidentally run out into the road or something). Whereas the Dyrham Park event is at a big old stately home so there'll be plenty of space for her to race around before I pop her in the buggy and push her round for a bit while I browse the gorgeous wares on offer. Sunday is also running and swimming day, things were a bit mental this morning as we prepared for the off. On Friday, the husband asked Miss A to make him brownies and she's been pestering me ever since to let her do this so I figured we'd fit it in between getting back from swimming and going out to the food festival. For once I was uber-prepared with all the ingredients weighed out ready in little bowls so we just had to mix, bake and then go. I wanted to do something a bit different with these brownies. As nice as my favourite recipe is, I wanted something a little more adventurous. Rooting through the cupboards, I realised I didn't really have enough of any one ingredient or even two different ingredients so I decided I'd just weigh out 200g of random things and throw it into the mix. Hence fully loaded. I went for marshmallows, dark and white chocolate chunks, pistachios and dried cherries. And it worked really well. When the husband finally got to sample one, he then revealed that what he actually wanted was my signature whoopie pies (chocolate with Baileys cream in the middle), not brownies. He thought because they were brown they were classed as brownies. Chop the chocolate and butter into small pieces, place in a glass bowl over gently simmering water and stir until just melted. Set aside to cool. Lightly beat the eggs with the sugar and vanilla. Stir into the cooled chocolate mixture. Sift the flour, cocoa and baking powder into the chocolate mixture and stir well until just combined. Mix in the fruit, nuts and sweets. Pour into the cake tin, level the top and bake for forty-five minutes. The cake should be just about set with a slight wobble in the middle. 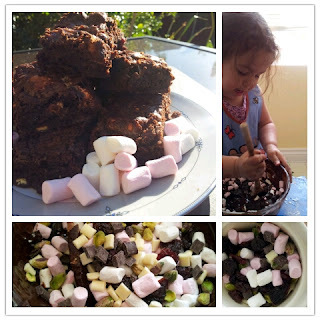 If you use marshmallows, the edges and top are likely to be a little crispier than normal brownies. Cool completely in the tin and then cut into sixteen pieces.